DETROIT — Back in 9th grade I remember a teacher yelling me and a classmate as we laughed uncontrollably. We were watching a movie about a 1960s psychological experiment at Yale on peoples’ willingness to obey authority. It was called the Milgram Experiment. A male volunteer was assigned to be a teacher. A middle-aged decoy, who sat in another room, was the “learner” or student. The teacher asked questions through an intercom, and each time the learner gave a wrong answer, the teacher delivered an electric shock. The voltage increased with each incorrect answer. The learner really wasn’t getting a shock, but the volunteer didn’t know that. Before long, the learner shouted “ouch” after each shock (it was actually a recording) and complained about a heart condition. Some of the volunteers refused to continue, even after a facilitator ordered them to. But others, albeit hesitant, kept delivering shock after shock as directed. They felt pressure from the facilitator. They were just following orders. 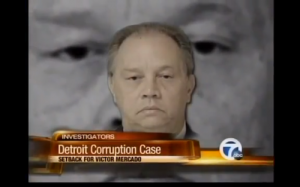 I’m reminded of that film as the corruption trial starts Friday for ex-Detroit Mayor Kwame Kilpatrick. Four people are standing trial, including Victor Mercado, the former water department boss, who claims that he felt pressure from the Mayor, and was just following orders. Besides Kilpatrick and Mercado, co-defendants include contractor Bobby Ferguson and Kilpatrick’s dad Bernard Kilpatrick. The feds charged that Mercado, 61, helped delay or cancel city contracts, at the behest of the mayor, so contractors would be forced to give Kilpatrick’s friend Bobby Ferguson a piece of the action or kickbacks. Ferguson then allegedly spread the love to the mayor and his father. Posted: 9/19/12 at 12:39 AM under News Story.